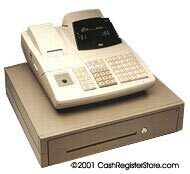 TEC Cash Registers at Cash Register Store.com. The TEC MA-186 ECR product is the perfect solution for the small retailer who requires a product with sophisticated features, yet is easy to use and economical to own. The introduction of the New Electronic Journal Feature will allow the user to enjoy the many benefits of a two station printer. The TEC MA-186 provides high levels of Cashier/Clerk convenience, increased speed, improved accuracy, added productivity and extended reliability. Modern styling and a compact low profile design make the TEC MA-186 ideal for a wide variety of small retail applications. Drum printer, 3.3 lines per sec.